Anyway, I wanted to use some different art materials, something other than the acrylic paint I have been using lately. A long time ago, I bought a lovely set of colored pencils, based on the recommendation of my then-boss's husband, who was an artist (the husband was the artist, not my boss). I love my colored pencils and have used them here and there but never with a lot of intention (or confidence, since I can't even draw stick people). This seemed like a good opportunity to do that. I wasn't satisfied with any of the photos I took of my beloved anemones. The glare off the water dulled their colors, angles weren't right, things blocked my shot...at the end of the day, none of my photos made me happily recall the beauty of these wonderful creatures. So I made a black and white copy of one of the photos I took of a giant green anemone (which was eating a crab) and decided to color-pencil it in. And I'm so glad I did. Outlining and coloring in the tentacles was a blast as much as it was tedious, but it left me appreciating, once again, how magnificent these relatives to the jellies are. All those little arms swaying gently back and forth, each in what seems like their own little world, and then suddenly, WHAM, dozens of arms instantly synchronized in action and taking down its prey! How cool is that?! After liking how I transformed the photo, I needed to figure out how I wanted to display it on the page. I'm really into texture right now; I like things to look and feel "not smooth." In museums or at shows, I'm always drawn toward the artwork that makes me want to touch it, that redefines what "surface" is or looks like. 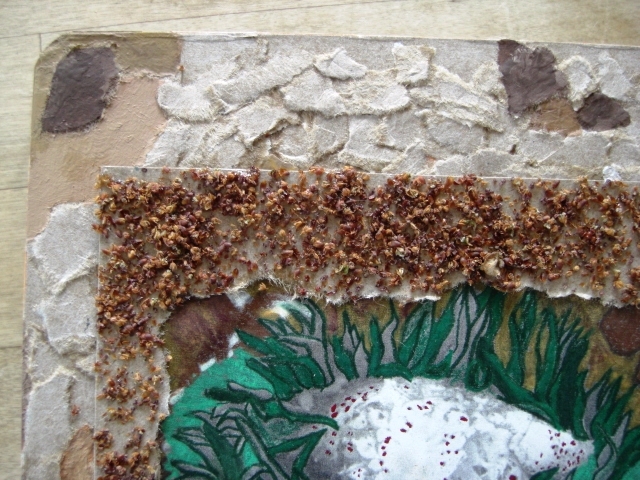 So for the border immediately around the photo, I glued dried fruit seeds (or whatever they are) that are falling off our Chinese elms in our front yard (and all over our porch, table, chairs, candle holders, etc.) 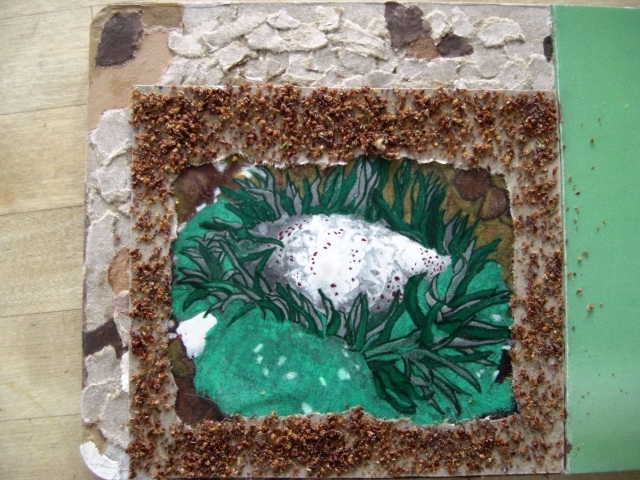 And then around that border, I filled the rest of the page with torn cardboard, hoping to create a pebble look/feel that resembled the sea anemone's natural surroundings. I'm not sure I'm done with this page yet. I have a feeling I'll be adding something more to it as I work on the rest of the book, but for now, I'm quite pleased with where it is at. I have something really fun planned for the next few pages, which I'll be working on this week. 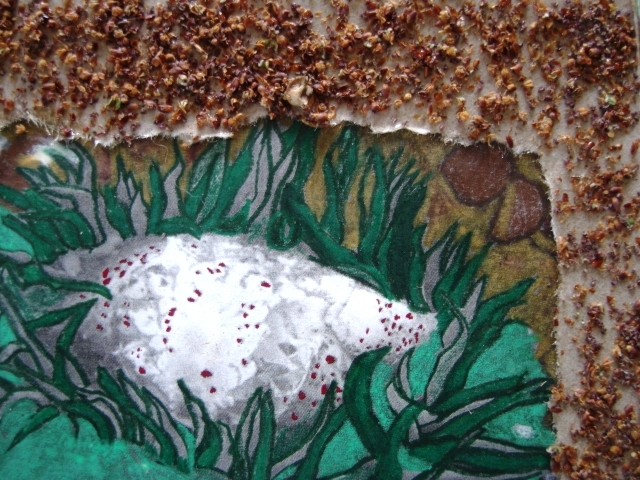 Stay tuned for more from the great Moss Beach Collage Book!